Breaths of sleepless air between them, the city’s inhabitants bustle through the streets, a menagerie of robots, slug people, and humanoids, from giant-sized to diminutive, all moving in an unchoreographed dance across the pavement. There is a little-known myth that, as it was being built, the sprawling metropolis of New Logan whispered a promise to Gallagan, assuring the world that this city would be a manifestation of beauty, diversity, and mystery. 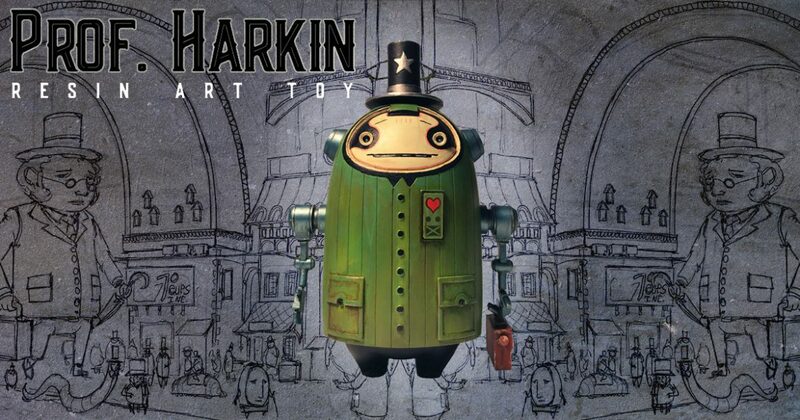 “There is no place like it”, Professor Harkin’s mechanical mind thinks, the whistling of his squeaky joints stopping as he unknowingly mirrors the otherworldly words of Walt Whitman, “no place with an atom of its glory, pride, and exultancy”. Appointed as a California Arts Scholar during his high school years, Matt Gaser majored in illustration at the ArtCenter College of Design while interning at the Klasky Group during their heyday. And since graduating, Gaser’s talents have been employed in fantastical video games, imaginative animations, and even for the surreal stages at the heart of each year’s Daydream Festival. Amid this professional work, Gaser has developed his own scenes and settings, through both illustrations and sculptures, each populated with bizarre and distinct characters that entice the viewer. Spanning from idyllic countryside landscapes to busy city views, one such place that he’s frequently delved into over the years is Gallagan. A seemingly neo-Victorian landscape populated by not only the nearly recognizable but also the utterly alien, this world’s diverse denizens are well-represented in New Logan, Gallagan’s version of New York City. It is here that one can find Liliputian-sized people who scurry away from the footfalls of giants the size of buildings as well as worm-like creatures that bow their heads as they pass many-legged, big-headed beasts. This city is even home to a plethora of Steampunk-inspired robots, such as Professor Harkin, a complex mathematics teacher at the Kronsworth University for Gifted Entities. And, following the success of his first monograph art book, Fantastical: The Art of Matt Gaser, the artist embarked on bringing New Logan and Gallagan to three-dimensional art toy life with Professor Harkin as its harbinger. After working on a concept painting for the Professor Harkin character, one he’d reference while creating the piece’s orthography, or front, side, and back views, Gaser approached his friend Ryan Calloway to create the 3D model and employed Images In Motion to print the sculptural form. Having had two casts of the form already made, Gaser hand-painted the one pictured above to be used as a reference master for the final edition’s production. Decorated with a weathered finish to denote the stains and grime accumulated throughout Prof. Harkin‘s dutiful service, this 8½-inch tall form is accompanied by a briefcase accessory which slips on-and-off of his partially closed hand. Set to be produced in resin by “a highly respected art toy company in L.A.”, who will oversee the entire manufacturing process of this piece, Gaser intends to create an edition of 300 pieces. With the majority slated to be factory-painted in the likeness of the pictured rendition, an intended 50 copies will be withheld for “variant color” renditions painted by Gaser. And just as how New Logan is the home to a bevy of fantastical inhabitants, Gaser is already considering his next art toy renditions from the world of Gallagan, a trio of new characters potentially to follow Prof. Harkin into three-dimensional life. Click Here to Acquire Matt Gaser’s Prof. Harkin Now.